Trunks: Erect, sometimes reclining, crown dense; branches numerous, low; bark grayish-brown, shallowly furrowed, sometimes peeling in this strips. Twigs: Reddish-brown, slender, flexible, coated with gray, scaly pubescence; older twigs becoming glabrous; twigs often ending in a short spine; leaf scars small, half-round, bundle scar 1; buds ovoid, 1/10 inch, obtuse, blunt, gray scaly. Leaves: Alternate, simple, deciduous; lanceolate to narrowly ovate, 1.8 to 3.6 inches long, 1/2 to 1 inch wide; base cuneate; margins entire, often undulate; tip acuminate to obtuse; upper surface dark green, whitened with minute scale-like stellate pubescence, lower surface silvery-white, densely covered with the scales; petiole 1/3 to 1/2 inch, scaly. 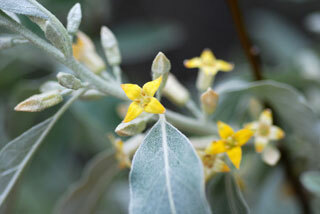 Flowers: Solitary or in clusters of 2-3 in leaf axils of current yeast's growth; pedicels 1/8 to 1/4 inch; calyx lobes 4, fused below, spreading or reflexed above, petal-like, silvery scaly on the outside, yellow on the inside, triangular, 1/8 to 1/6 inch; petals absent; stamens 4, anthers yellow; ovary concealed in calyx tube; stigma linear, recurred, often exserted. Habitat: Sandy, moist soils; disturbed open areas, roadsides, stream edges, lake shores. Uses: Planted for windbreaks and as an ornamental. Provides winter roosting for pheasants and nesting for mourning doves. Birds eat the fruits and squirrels the bark and young branches.